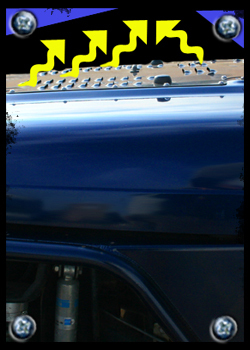 The American Rock Rods hood louver panel design was originally draw up by Clifton Slay in 2007 to be a simple and cool looking addition for displacing heat from your engine compartment. 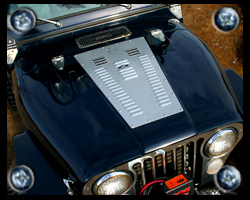 The act of removing, stripping, punch louvering and finally repainting your hood can be laboring and expensive. 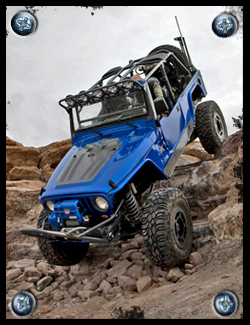 The American Rock rod's hood louvers simplify this exercise of removing damaging heat while simultaneously increasing style and function. 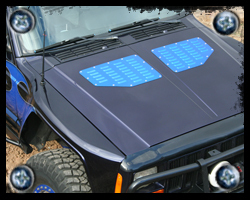 HEAT DISSIPATION & DESIGN: The primary function of the louver panels is to allow heat to escape from your engine compartment, as rising temperatures are damaging to your engine and degrade under hood components and their performance. 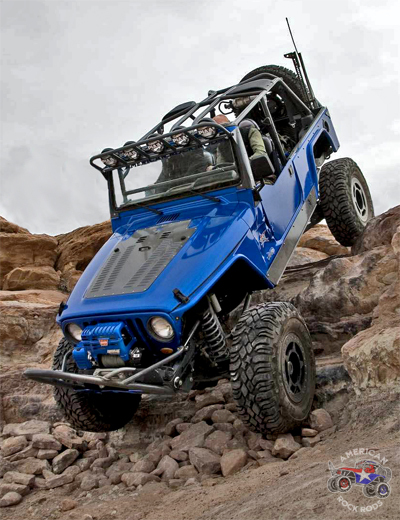 American Rock Rod's louvers are designed to alleviate pocketed heat zones where hot air collects. 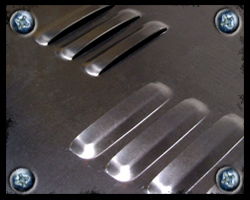 We utilize back facing louvers in areas where air passes during higher speeds drawing air through negative pressure. 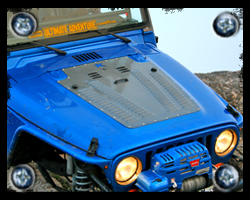 Forward facing louvers are used under the same principle with backward flowing air coming off of the windshield. 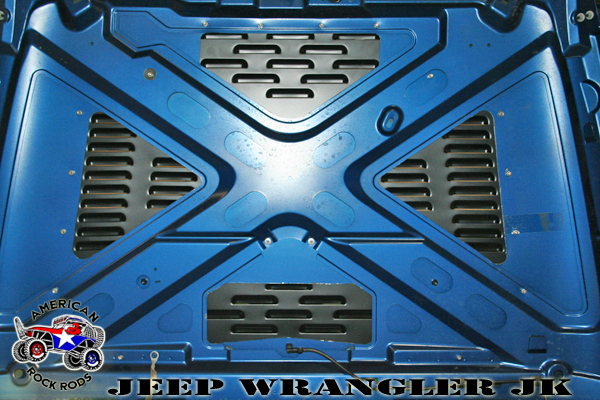 Many of the hood louver styles use forward facing 4" louvers in these sections to maximize flow in a limited area. 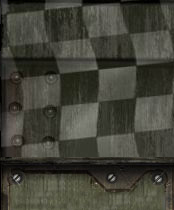 The reason that some louver panels do not employ forward facing louvers, is because that particular vehicle's air dynamics do not create a backward flowing air vortex. 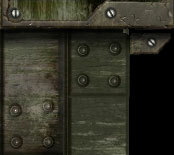 Thus making that particular design attribute unnecessary for every application. 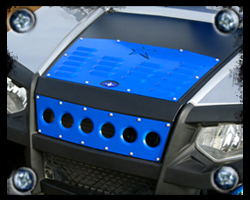 During low speed travel both forward and rear facing louvers release heated air radiantly without air speed or pressure being a variable. 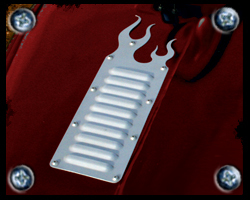 Hood louvers are individually punched with traditional hot rod style louver dies for maximum style and performance. 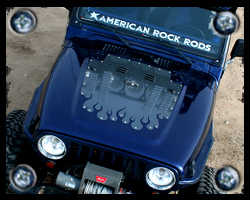 American Rock rods does not utilize open faced HVAC louvers on our panels. 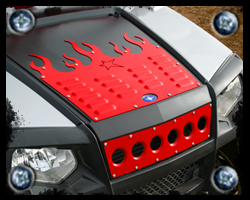 BASE MATERIAL & MOUNTING: Hood louver panels are crafted from CNC cut aluminum sheet. 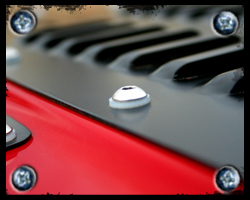 Mounting hardware includes either 1/4" or 10/32" button head stainless bolts, which ever is applicable to the panel design. Further, each bolt comes with a corresponding nylock locking nut and backing washer. 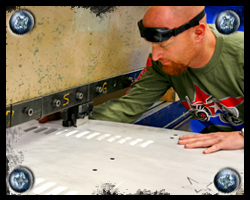 To ensure finish and paint integrity, nylon washers are also includes for the top mounting surface. 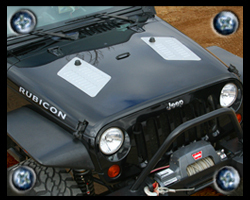 HOOD SECTION REMOVAL: To maximize the pure function of the hood louver panels you must cut out and remove sections of your hood in alignment with the louvers. 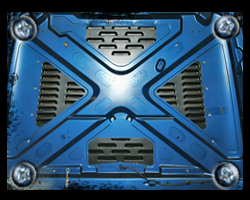 We have strategically located the louver groupings to parallel both pocketed heat zones and focus louver locations where they are actually functional. There are no non functioning louvers that are located over body cavities or hood supports that cannot function as a heat escaping passage. 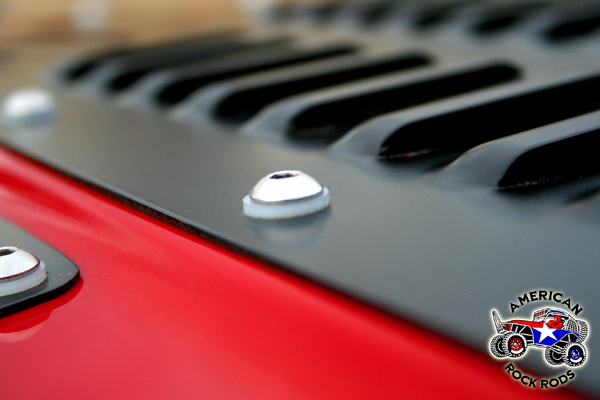 If you have sensitive electronics or aftermarket air intakes that are located below the louvers, you can leave those sections of your hood solid to avoid interference from moisture. 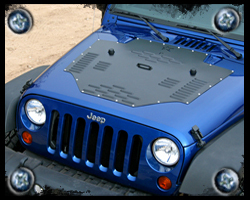 HOOD LOUVER FINISHES: American Rock rods hood louver panels come in three basic finishes. 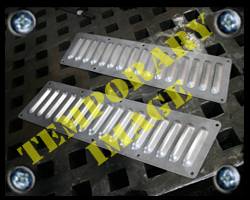 The base material is aluminum, which is machine sanded prior to louver punching. If you order the basic louver panel, it will arrive in this configuration ready to be painted or powder coated at your location. American Rock rods does not recommend leaving the louver panel in this exposed state as the sanded aluminum finish will deteriorate in appearance from outside elements. 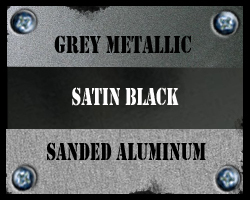 The other two finishes we offer are satin black and metallic grey powder coating. 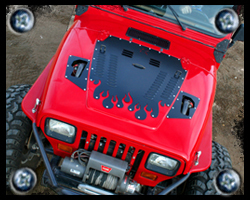 The "Jeep YJ flame" image below best represents the satin black finish. 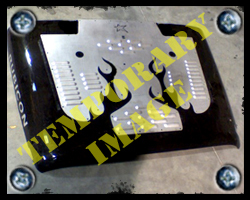 The "Jeep TJ flame" image below best displays the metallic grey powder coat finish. 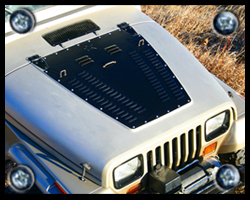 Click on the images below to see larger views of varying perspectives of specific hood louver designs.